Congratulations! Your burger restaurant is getting international attention and is ready to be taken to the world stage. Expand your restaurant's repertoire by adding unique flavours from around the world. 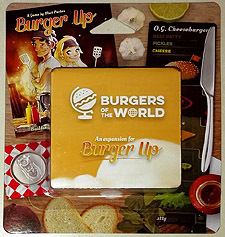 Burgers of the World expands the Burger Up game with 6 new Top Bun and 24 new ingredient cards from 5 different countries: Australia, France, Germany, Japan, and Mexico. It also includes the customisable Globetrotter set, giving you a way to make yuor very own masterpiece. Requires the Burger Up base game to play.